Tactical discipline and never-say-die spirit have been the hallmarks behind Ħamrun Spartans’ bright start to the 2018-19 Premier League season. On Saturday, the Spartans produced another gritty performance against neighbours Pietà Hotspurs as despite throwing away a two-goal lead they still managed to fight back and a Wilfried Domoraud goal three minutes from half-time handed them a 3-2 win. This was the Spartans’ sixth win from their last seven matches in all competitions and enabled them to join Sliema Wanderers and Balzan in fourth place on 22 points. Enrico Pepe has been one of the key performers for the Spartans as the arrival of the former Floriana defender has played a key role in turning the Reds into one of the tightest backlines in the top flight and in fact they are currently the third best defence in the top flight with only nine goals conceded in 12 matches. 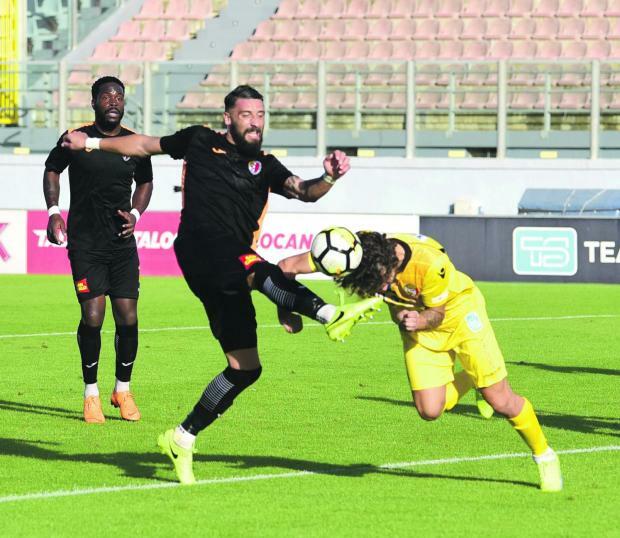 Contacted by the Times of Malta, Pepe admitted that he was annoyed by the team’s defensive lapses late in the first half against Pietà but said that at the end of the day, the most important thing was that they managed to return home with all three points in the bag. “I have to admit that our performance against Pietà Hotspurs was not the best from our part this season,” Pepe said. “This season we have established a blueprint of a side that concedes very little and therefore when you concede two-quick goals following glaring defensive mistakes, it’s clear that we cannot be fully happy with our display. Pepe has been one of the Spartans marquee signings this summer after he decided to reunite with his former mentor at Floriana, Giovanni Tedesco, who had just taken over at Ħamrun. The 28-year-old revealed that when his contract with Floriana expired he had doubts on whether he would extend his experience in the Maltese Premier League. However, coach Tedesco and team manager Gaetano Farrugio had made him feel wanted and has no regrets in signing a contract with the Reds. “When my contract with Floriana expired last summer, I received a few offers and I had my doubts on whether I would stay in Malta,” Pepe said. “I chose to bide my time and when Tedesco and team manager Gaetano Farrugio made their approach, they made me feel special and I could understand how much they wanted me to join the club. “To have the opportunity work with Tedesco made it easier for me to come here. He works a lot with the players and helps them improve with his coaching methods and above all I always had a great relationship with him. Next up for Ħamrun is a daunting match against champions Valletta. The Citizens are passing to a rich vein of form and last weekend they laid down another marker when they crushed Tarxien Rainbows 7-0. Pepe is aware of the difficult task awaiting his team against the Citizens but promised the club fans that he and his team-mates will do all they can to return home with a positive result. “A match against Valletta is always difficult given the quality of players they have in their squad,” Pepe said. “But we have shown time and again this season that we are capable of matching all the teams in the Premier League and we’re looking forward to this challenge. I know that this is a match that is felt a lot by our fans given the huge rivalry that existed between the two clubs in the past so, no doubt, there will be a lot of expectations from our fans. “It’s imperative that we are focused and work hard for each other as we did in all our matches this season. We are going out to try and make life difficult for our opponents and try and pick up more valuable points. “Our goal at the moment is to try and remain close to the top four teams in the division to make sure we are in a good position to battle for a top-four placing come the end of the season. “I know that there is a great desire at the club to end a long drought of trophy and surely it’s a great motivation for me and the rest of the players to be able to bring success to the club after so many years.